November 19, 2014 - Walmart – the world’s biggest retailer - has today opened a cutting-edge technology centre at Asda’s head office in Leeds, enabling a more efficient and streamlined service for its online customers worldwide. The centre is the first of its kind in the UK and will enable Asda and parent company Walmart to better monitor all traffic and interactions with its global websites 24 hours a day, seven days a week. 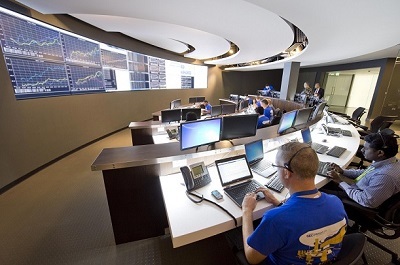 The new mission control operations hub, or NOC as it is known in the industry, will coordinate with existing centres in Silicon Valley, California and Bangalore, India to monitor 11 of Walmart’s existing websites, including Asda.com and George.com, as well as Walmart’s online operations in Mexico and Canada. Each centre will monitor the network for an eight-hour period before handing over to the next centre in sequence - building a 24-hour operating system that truly ‘follows the sun’. The new system is expected to enable Asda and Walmart to identify and address any issues with its websites five times faster than before, helping the companies to deliver a better and more efficient customer experience. The opening of the centre today will generate 14 new roles in Leeds, building on Walmart’s existing 2,500-strong Global E-commerce team. “Walmart’s decision to invest in the UK and bring the latest of its retail innovations to Leeds demonstrates the integral role that Asda plays in the Walmart family. The opening of the centre is the latest of a number of investments Asda has made this year in its online business. In September Asda announced that it had acquired a technology that will bring the first fully automated Click and Collect pods to the UK from early next year. The state of the art technology has been developed in Holland and will see online food and General Merchandise shopping orders delivered to stand-alone temperature controlled units where customers can collect their purchases at a time convenient to them. Founded in the 1960s in Yorkshire, Asda is one of Britain’s leading retailers. It has more than 170,000 dedicated Asda colleagues serving customers from 583 stores, including 32 Supercentres, 324 Superstores, 34 Asda Living stores, 191 Supermarkets, 2 stand alone petrol stations, 26 depots and seven recycling centres across the UK. Its main office is in Leeds, Yorkshire and its George clothing division is in Lutterworth, Leicestershire. More than 18 million people shop at Asda stores every week and 99 per cent of UK homes are served by www.ASDA.com. Asda joined Walmart, the world’s number one retailer, in 1999.